Double rod curtain rods by Kirsch. Kirsh drapery rods. Two way draw, includes 10 slides. Double drapery rods. Curtain hardware for the budget minded. This set includes a two way draw traverse rod and a plain curtain rod for a combination drapery and curtain window treatment. Empire Traverse Rods are made from heavy guage steel with a baked enamel finish. Quick mounting drop in brackets and supports that fit over rod are included. Cord guide is included to hold cord to wall. The Empire rod has self lubricating pulleys and slides.Polyester cor and continuous lacing for use at either end or to convert to one way draw. Custom drapery rods. This is an assembled Cut To Measure set. Truck freight over 104". White steel traverse rod with mounting hardware. 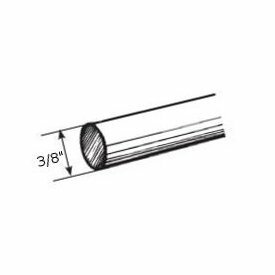 Single lock-seam standard curtain rods 48-84" projects 3 1/2"
Projection, 3 1/2 inches from mounting surface. Graber lock-seam curtain rods are made of .013 gauge steel and measure 3/4 x 3/8 inches for extra strength. They are coated inside and out, leaving no exposed edges. For medium to heavy curtain fabrics. Includes mounting hardware. 4-232-1: Single lock-seam standard curtain rods 28-48" projects 3 1/2"
4-235-1: Single lock-seam standard curtain rods 84-120" projects 3 1/2"
Graber Dauphine Curtain Rods come in two facial sizes, 2 1/2" and 4 1/2". These curtain rods can be used with wide pocket curtains or valances to achieve the look you desire. Available in white finish up to 156" long. Combinations, curved and bay window models and even a spring tension model for your exact needs. Pocket sizes need for the 4 1/2" is 5" to 5 1/2" and the 2 1/2" requires 3" to 3 1/2" pocket. Inside mount bracket for 2 1/4 inch wood curtain rods. 3 5/8 by 1 by 4 3/4 inches. Renaissance Collection by Design Elements. Wood curtain rod brackets for the Renaissance collection. Leaf rings 2 3/4 inch inside diameter, 4 3/8 inch outer diameter. Renaissance Collection by Design Elements. 8 foot twisted wood curtain rod 2 1/4 inch diameter. Decorative curtain rods for any window. Renaissance Collection by Design Elements. The Renaissance Collection by Design Elements is available in 2 1/4" diameter wood poles in a unique twisted and fluted design. Wood and resins are used to put together a wide assortment of accessories for this collection. Accessories include finials, brackets, rings, wands and holdbacks to match the Antique Oak, Mahogany and Antique Gold finishes. Quick shipping is standard on these items. Free cut down is available at no charge to allow standard shipping on rods over 105 inches. Cut items are not returnable. Bulk pack, 50 pair. White finish. For Continental I 4 1/2" curtain rod. 6612Eo-025: Continental I bracket clearacne 4 1/2" to 5 3/4" or 7 1/2"